Part three of Martin Lowe’s (@plasticpitch) look at four West Asian leagues as they kick off their domestic season. Here, he looks at the Qatar Stars League and what effect the opulent Sheikhs have on the league’s global image and the national team ahead of the Asian Cup. Ever since the decision to grant Qatar the World Cup in 2022, the world’s footballing eye has been firmly fixed on the small Middle Eastern country, which has been seen to make great strides in their footballing advancements over the last decade. The Qatar Stars League (QSL) has been the quintessential European stereotype of a Middle East league. Big spending and low attendances has led to many back in Europe grumbling at their star players being attracted by the money of the Sheikhs. However, the league’s quality on a whole has quickly risen with notable performances in the Asian Champions League (ACL) being proof of that. The world class names of Fabio Cannavaro and Raul have come and gone, but the spending continues to this day with a greater depth of previously-European based players being bought in to improve the league further. Despite a limit on overseas registered players in the squad to seven, QSL sides have adopted a trend of nationalising some of their overseas recruits, not only to improve the national team squad ahead of 2022 but to increase their number of overseas registered players at home and on the continent. Examples can be seen throughout the league; Uruguayan born Sebastian Soria is the Qatari national side’s leading marksman after being nationalised in 2006, while Qatar’s largest and most successful club Al-Sadd were led until last season by exiting captain Abdulla Koni, a Senegalese born defender who has carved out a decent career in his adopted country. These are typical stories of mainly African and South American players who have opted for a lucrative career in the Middle East ahead of an uncertain European club path that is usually seen as the norm. It’s a practice that isn’t showing any signs of waning, with young Nigerian striker Imoh Ezekiel, who has yet to make a competitive start for his country of birth despite only being narrowly cut from the World Cup squad this summer, being brought in by Al-Arabi from Standard Liege with a potential nationalising process rumoured to be part of the bargain. For 20 year old Ezekiel, a “home! World Cup in 8 years-time is a tempting prospect despite his obvious allegiances towards Nigeria, arguably further motivated by the large pay package which is part of the deal. This summer, just like those over the past decade has seen further recruits added to the league, with many being scouted this transfer window at the World Cup in Brazil. Alongside the playing staff, the likes of ex-Swansea City coach Michael Laudrup and ex-Dinamo Moscow manager Dan Petrescu coming in offers further quality to what looks to be an enticing season for the QSL. Unlike other Middle Eastern leagues, the QSL remains highly competitive with the vast majority having similarly deep pockets to compete even if they are way off ACL qualification. Traditional heavyweight Al-Rayyan felt this to their cost last term as they were relegated to the Qatar’s second tier (Qatargas League) despite spending big in previous seasons. While Al-Sailiya clinched 4th spot and Asian football last season after only being promoted the previous term. That said, Al-Sadd, Qatar’s only ever previous winner of the ACL and final participant in the knockout stages this year, will go into this season as the favourites for domestic glory after concurring last season’s champions Lekhwiya in last week’s curtain- raising Sheikh Jassem Cup final. Al-Sadd have amongst their armoury some familiar faces; Brazilian striker Muriqui has been brought in from Guanzhou Evergrande to line-up with former Portsmouth left wing-back Nadir Belhadj and veteran Senegalese goal scorer Mamadou Niang. Goalkeeper Saad Al-Sheeb and midfielder Khalfan Ibrahim bolster their home contingent. 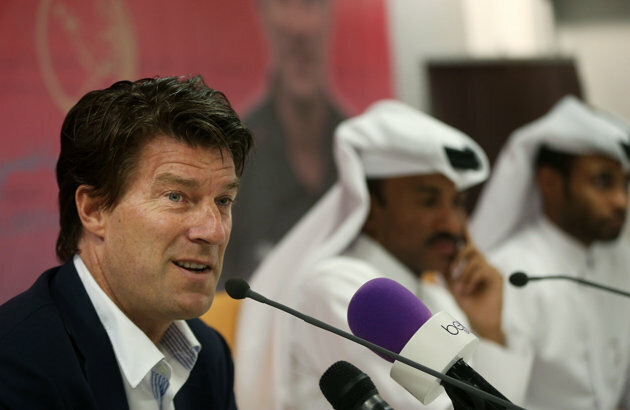 Lekhwiya, who are Al-Sadd’s closest competitors for the QSL crown, have just appointed Michael Laudrup as their coach for the new season, bringing across with him Chico Flores from Swansea City and introducing former Manchester City youngster Vladimir Weiss to the squad. Of their existing setup, Tunisian Youssef Msakni complements well the goal scoring exploits of Sebastian Soria, while Khalid Muftah has impressed in recent times for the national side in defence. El-Jaish and Al-Sailiya will join the two QSL giants in next year’s ACL, with both making significant improvements to their defence by bringing in established European stars this summer. El-Jaish have brought in Lucas Mendes from Marseille to join a broadly Qatari born squad that includes internationals Wesam Rizik and Magid Mohamed. Al-Sailiya who have capped a miraculous rise over the last two seasons, have brought in Portuguese centre back Ricardo Costa to firm up their backline as they debut in the ACL. Key transfer highlights from the rest of the division include the arrival of Jeromie Aliadiere for Umm Salal to join up with former Premier League striker Tuncay Sanli and Iranian World Cup defender Pejman Montazeri, while Al-Arabi have purchased two former Premier League playmakers Pablo Hernandez and Ashkan Dejagah ahead of the new season, in hope that new manager Dan Petrescu can break into the top four next season. The other contenders for Asian continental football qualification are Al-Ahli and Al-Ghaafa. Al-Ahli possess DR Congo international Dioko Kaluyituka, last season’s golden boot winner, and he is backed up by playmaker Mojtaba Jabbari and new signing Jalal Hosseini. Al-Ghaafa, who are built on the foundation of national team keeper Qasem Burhan, will be hoping for a better finish than their mid-table showing last term with the attacking play of Australian Mark Bresciano and Argentine forward Lisandro Lopez amongst those in a talented squad. While the national team remains in flux ahead of a new World Cup cycle and 2015’s Asian Cup, a number of their youth sides are starting to reap the rewards of careful planning that they hope to peak ahead of 2022. The national league continues to grow, and with continued success on the continent becoming more than a flash in a pan year on year, further improvement for the Qatar national side is likely. Lol, I knew qatar was going to pull an extreme version of “Algeria” for their world cup, afterall they’ve been stealing Kenyan athletes since the mid 2000s. If players can be naturalized at will, why not just kill international football.